The celebrated jurists Sir Frederick Pollock (1845-1937) and Oliver Wendell Holmes Jr (1841-1935) maintained a regular trans-Atlantic correspondence between 1874 and 1932, in which they discussed many points of law, as well as more personal matters. 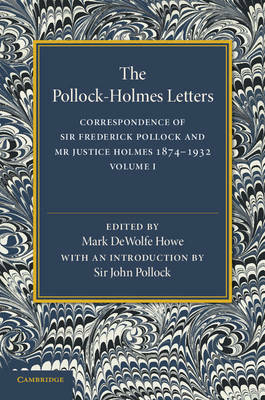 After Holmes's death, his papers were donated to Harvard Law School, and in 1942 this two-volume collection of his correspondence with Pollock was published, edited by Harvard alumnus Mark DeWolfe Howe. Volume one contains the letters dated between 1874 and 1918 and includes their discussion of topics such as the American Civil War and World War One, as well as legal decisions made by Holmes in his capacity as a judge of the United States Supreme Court. This book will be of value to anyone with an interest in legal history and the relationship between American and English law.